It reminds me of one of Master Leong’s fist strikes which he taught. At that time I wasn’t a fan of curving punches due to my training in Wing Chun. However, seeing how Master Leong can use footwork to evade my Wing Chun straight punches to land his curving punches from long range made me pause, review and rethink my understanding of strikes. 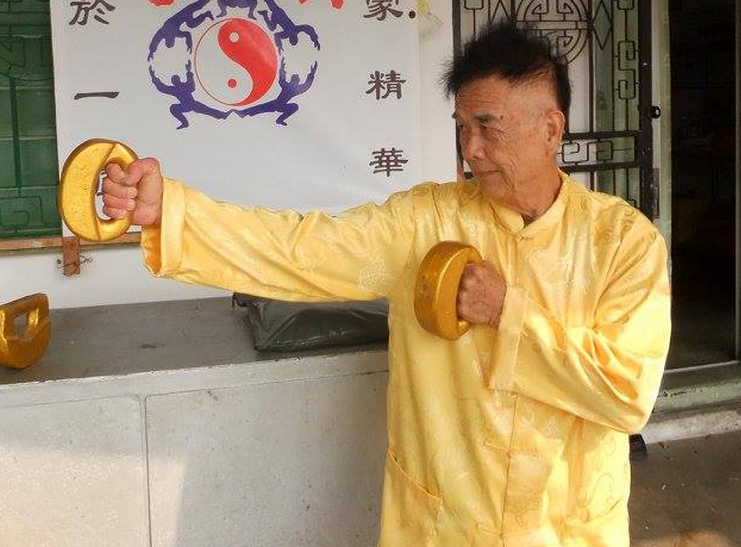 The power of Master Leong’s curving strikes were trained with iron locks. In the picture below of Master David Chik who is a Facebook friend and a master of Pok Khek you can see the uniquely shaped iron locks used for the training of the range of curving strikes. I have trimmed the photo – the original can be viewed here. Apologies to Master David for using the photo without telling him. Readers (if you can access the link) please take a look at the other photos there such as this particular photo – its a demonstration of the amazing power and hardness that can be cultivated in the art of Pok Khek (alas I don’t have this skill) and one reason why you should never directly block such a strike. This entry was posted in General, Learning and tagged nipcheefei, singaporetaichi, taichi, taichichuan, taichisingapore, taiji, taijiquan by Mushin. Bookmark the permalink.